Whenever you see a band of bikers roaring down the highway, you’re probably inclined to slide out of the way. But, why is this? It’s because they’re tough, right? Or is it because you think they’re dangerous? Maybe. The bad boy biker image has been around for decades, constantly being built upon. This image can be traced back to one event, one moment that forever changed the way we think about bikers. The story behind this event is something that everybody should check out, and we have it for you here. 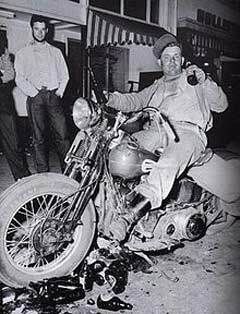 This entry was posted in Misc and tagged Biker Image, Bikers, Hollister Riot, Motorcycles, The Wild One. Bookmark the permalink.